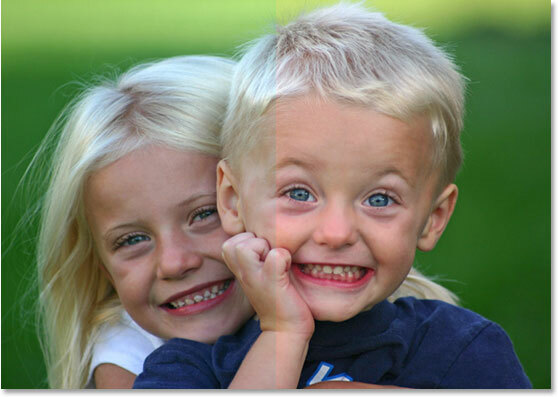 When it comes to editing images in Photoshop, the first thing we always want to do is fix any overall tonal and/or color problems in the image (commonly referred to as "global" problems) before moving on to more specific problem areas ("local" problems), and the tool of choice for the task is the same today as it's been for years - Photoshop's Levels command, which not only handles the job like a pro, it makes overall tonal and color correction incredibly simple and easy. In this Photoshop tutorial on photo editing, we're going to see just how easy it is. Again, this is the step you always want to start with when editing your images, so having said that, let's get started! Double-click on the white point eyedropper. Enter "245" into each of the "R", "G" and "B" input boxes. By default, the white point value is set to 255 for each of the "R", "G" and "B" options, which in Photoshop's world means pure white. By lowering the values a little to 245, this will help us maintain detail in the lightest parts of the image by preventing them from becoming 100% white and being printed as paper white. 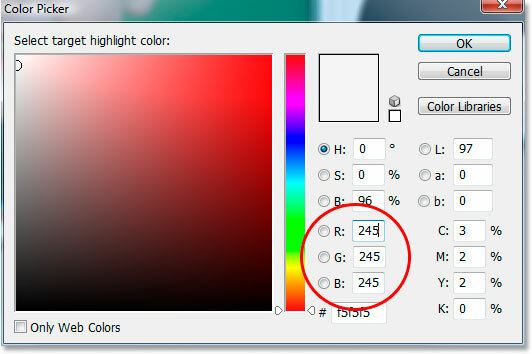 Click OK to exit out of the Color Picker when you're done, although we'll be seeing it again in a moment. Double-click on the black point eyedropper. Enter "10" into the "R", "G" and "B" input boxes. 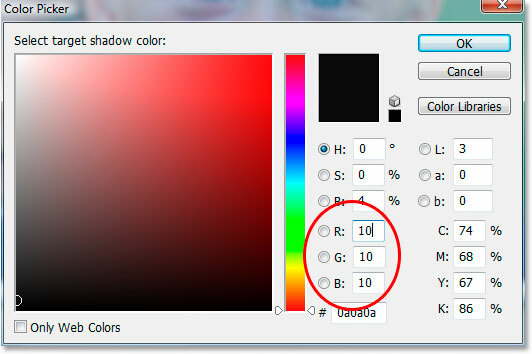 By setting this value to 10 rather than its default of 0, we'll prevent the darkest parts of our image from becoming pure black, allowing us to maintain detail in the shadows and also save us a little black ink when we go to print the image. Click OK to exit out of the Color Picker. Photoshop asks if you want to save the changes as the new default white and black point values. Click "Yes". Now that we've set up our white and black point values to something a bit more useful to us, let's fix the global tonal and color problems in the image. Select "Threshold" from the list. Stop dragging the slider when you see the white areas appearing. 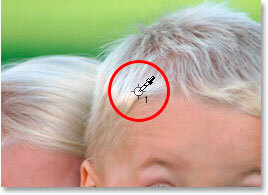 These are the lightest areas (the highlights) in the image. Hold down "Shift" and click inside a white area to place a target marker at that location. We're going to be using this target marker to correct the highlights in the image in just a moment. Drag the slider at the bottom of the Threshold dialog box all the way to the left, which will turn your image completely white, then slowly begin dragging back towards the right until black areas appear. These are the darkest parts of the image. Dark areas now appearing near the bottom of the image, indicating the darkest parts in the photo. Hold down "Shift" and click inside a black area to place a target marker at that location. We now have two target markers placed in our image. The first one, labeled "1" in its bottom right corner, is marking the lightest spot (or at least, one of the lightest spots) in the image, and the second one, labeled "2", is marking the darkest spot (or again, one of the darkest spots). We don't need our Threshold adjustment layer any longer, so click Cancel in the top right corner of the dialog box to cancel out of it. You'll see your two target markers disappear as well, but don't worry, they're just hiding. We're going to see them again as soon as we add our Levels adjustment layer, which we'll be doing next. Click the "New Adjustment Layer" icon once again. Select "Levels" from the list. Photoshop's "Levels" adjustment layer dialog box. The two target markers have re-appeared in the image. Click on the white point eyedropper icon in the bottom right corner of the Levels dialog box to select it. Click on the first target marker with the white point eyedropper to fix any tonal and color problems in the highlights. If you're having trouble lining up the eyedropper icon with the center of the target marker, press the Caps Lock key on your keyboard, which will turn the eyedropper icon into a target marker icon itself. You'll know you have the two target markers lined up perfectly when they both disappear from the screen, at which point you can click your mouse to correct the highlights. Click on the black point eyedropper icon in the bottom right corner of the Levels dialog box to select it. Correct any tonal and color problems in the dark areas of the image by clicking on the second target marker with the black point eyedropper. A comparison of how the image looked originally (left) and how it looks after correcting the tonal and color problems in the highlights and shadows (right). Click on the Midtone slider and drag it a little to the left to lighten the midtones in the image. Dragging to the right will darken the midtones. Keep an eye on your image as you drag the Midtone slider. The further you drag to the left, the more you'll brighten the midtones (dragging to the right darkens the midtones), but you usually don't need to drag the slider very far in order to get good results. If you do drag it too far, your image will start to look washed out. How far you drag the midtone slider is strictly a visual call on your part and depends entirely on your image. Once you've brightened your image with the Midtone slider (if your image needed it), click OK in the Levels dialog box to exit out of it and accept all the corrections you've made. Click on the Layer Visibility icon (the "eyeball icon") to the left of the Levels adjustment layer in the Layers palette to turn the layer on and off and cycle between the corrected and uncorrected versions of your image. Select the Color Sampler tool from the Tools palette, which is located behind the Eyedropper tool. With the Color Sampler tool selected, click on the "Clear" button in the Options Bar to remove the target markers from the image. It's not vitally important that you remove the target markers, since they won't print if you forget to remove them, but they do get saved along with the image so it's a good idea to remove them once you no longer need them. And with that, the overall tonal and color correction on the image is done! Don't worry if the first couple of times you go through these steps, you feel like you're stumbling through them and it seems to be taking longer than it should. Once you've gone through this process a few times with different images, it will start to seem like second nature to you and the whole thing shouldn't take you more than a minute. The only thing we didn't look at in this tutorial was color correcting the midtones. We brightened them using the Midtone slider, but we could have also tried to color correct them using the gray point eyedropper in the Levels dialog box (the eyedropper between the white and black point eyedroppers). There's a couple of reason why we didn't. The first reason is because often times, color correcting the highlights and shadows takes care of any color problems in the midtones as well. The second reason is because it's not as straightforward as correcting the highlights and shadows. In fact, it usually involves simply guessing where the neutral gray point in the image is supposed to be, and several "trial and error" attempts at it usually follow. Plus, not every image even has an area that's supposed to be gray, so trying to find what's not there is a bit pointless. However, there is a trick to finding the neutral gray area in an image (if one exists) and color correcting the midtones, and we have a complete tutorial on it, An Easy Way To Find Neutral Gray, which you can access here. Or, check out our Photo Retouching section for more Photoshop image editing tutorials!